Marlo Thomas (born Margaret Julia Thomas on November 21, 1937) is an American actress, who first achieved fame on the TV series That Girl in the 1960s. 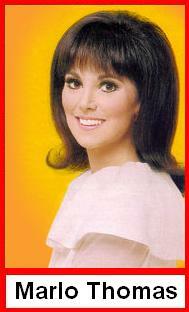 Marlo Thomas is the daughter of the late Lebanese-American comedian Danny Thomas and sister of Tony Thomas, a TV and film producer, and Terre Thomas, a former actress. Her mother, Rose Marie Mantell, was the adopted daughter of Italian Americans and died in 2000. Thomas was born in Detroit, but grew up in Beverly Hills, California, and went by the nickname of Margie Thomas while attending school. After graduating from the University of Southern California with a teaching degree, Thomas appeared as a regular on The Joey Bishop Show (1961–1962). She followed the series with guest shots on Ben Casey, My Favorite Martian, and Bonanza, but it was not until 1966 that she hit her professional stride as wannabe New York actress Ann Marie on the ABC sitcom That Girl. The series ran until 1971, garnering her a Golden Globe Award and four Emmy nominations. She is also known for her children's books and the recordings and television specials created in conjunction with them: Free to Be … You and Me (1972) and Free to Be … A Family (1987, with Christopher Cerf), which were born out of an attempt to teach her then-young niece Dionne about life. She is donating all royalties from her 2004 book and CD, Thanks & Giving: All Year Long (also produced with Cerf), to the St. Jude Children's Research Hospital in Memphis, Tennessee. Started by her late father, the organization helps young children suffering from grave forms of disease, especially cancer and leukemia, including many whose parents do not have much money or health insurance. Thomas has continued her legacy of charity and donation through her publications of The Right Words at the Right Time (6 January 2004, Atria Books ISBN 074344650X) and The Right Words at the Right Time Volume 2 (25 April 2006, Atria Books ISBN 0743497430). Both books are collections of essays written by celebrities and a fans of Marlo's, explaining when a friend, family member or perfect stranger said the right thing in the author's time of need. All proceeds go to her charity (St. Jude's Hospital). In recent years, Thomas has appeared in guest shots on Ally McBeal, Friends (as Rachel's mother), and Law & Order: SVU. She also appeared in the 2000 comedy Playing Mona Lisa with Alicia Witt and Harvey Fierstein. Thomas's favorable public image came under severe attack in 1990 when her former butler Desmond Atholl wrote a book called That Girl And Phil. This was an expose of sorts of the years he worked for her. Atholl claimed that contrary to her public image, Marlo Thomas was very cruel and incredibly foul mouthed towards her staffers, servants and pretty much everyone else. There were many people who came forward to corroborate Atholl's charges. One observer even claimed Thomas was profane towards a group of sick children in one of her Saint Jude commercials. Marlo once dated former Secretary of State Henry Kissinger. Marlo had rhinoplasty so when she started her career, she would have a smaller nose. Megan Mullally's character Karen in the NBC sitcom Will & Grace occasionally refers to Marlo as her neighbour.